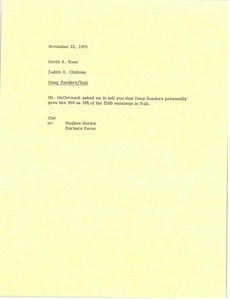 Chilcote reports that Doug Sanders gave Mark H. McCormack $50 as 10% of his $500 winnings in Bali. 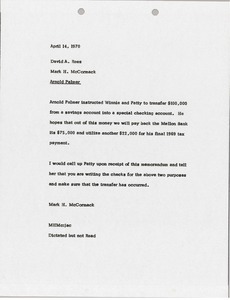 McCormack informs David A. Rees that Arnold Palmer has instructed Winnie and Patty to transfer money from a savings account inot a special checking account so the money can be used to pay back the Mellon Bank and for his final 1969 tax payment. 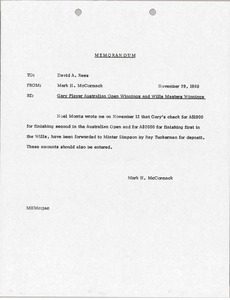 McCormack suggests that Rees call Patty and tell her that he is writing the checks for these purposes and make sure the transfer has occurred. Requesting that someone write to Noel Morris or Arthur Huxley in order to obtain the recent winnings of clients so that they may be entered into records. 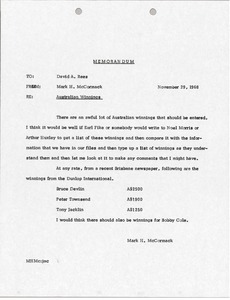 McCormack details winnings of Bruce Deviln, Peter Townsend and Tony Jacklin as detailed in a Brisbane newspaper. 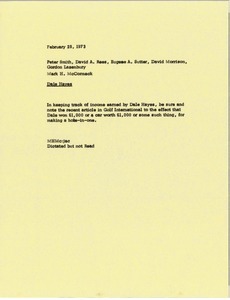 Concerning income sheets. Chilcote communicates comments McCormack made regarding errors in income sheets. 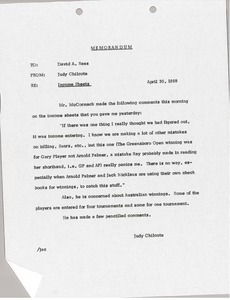 One example provided is winning being entered for Arnold Palmer instead of Gary Player and indicates that there is no error checking when players like Jack Nicklaus and Palmer use personal accounts for winnings. 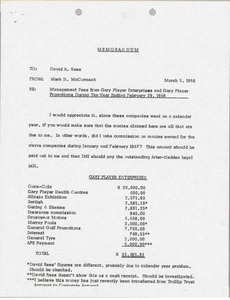 McCormack asks that when tracking the income of Dale Hayes, to be sure to note the recent article in Golf International which lists his recent winnings. 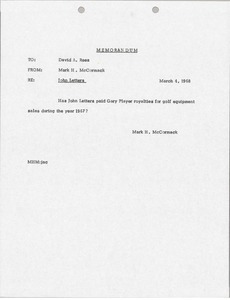 Wondering if John Letters paid Gary Player royalties for golf equipment sales during the year 1967. Concerning World Management Establishment. 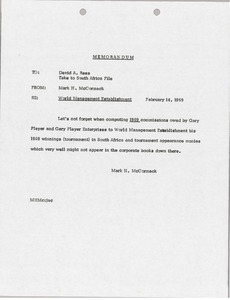 McCormack reminds Rees that when computing 1969 commissions owed by Gary Player and Gary Player Enterprises to World Management Establishment, his tournament winnings in South Africa and his appearance money may not appear in teh corporate books in SOuth Africa.